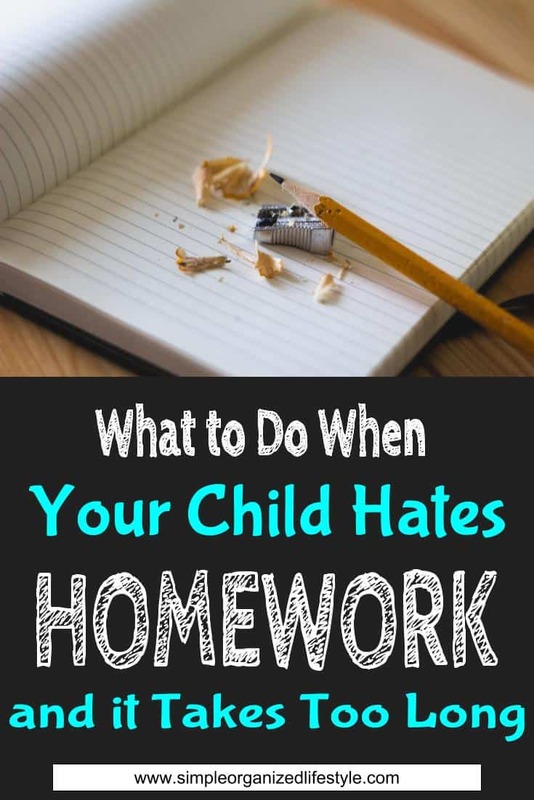 First, I want to briefly state where I stand on the issue of homework before I jump into the tips to help when your child hates homework and it takes too long. It might not be popular. 2- it’s not always serving a good purpose. I don’t think it’s any surprise that the Texas teacher’s “No Homework” letter went viral. It becomes a hot topic because people feel passionately about it on both sides. I believe students would perform the same- if not better– without additional worksheets or writing definitions after their school day. Just had to state my honest opinion first! While this may not be the most popular opinion, I have yet to find current research that proves otherwise, especially for younger students. A Stanford University researcher did a study on the effects of too much homework and concluded that it led to higher stress, health issues and less time for extracurricular interests. When homework is purposeful, it helps reinforce learning and develops good study habits. Regardless of how you or I feel about homework, it’s important to support the teacher and his or her policies. As parents, we all want our children to have a great school experience and be successful. So what can you do when your child hates homework and it takes too long? While I don’t have a perfect “cookie cutter” solution, I can offer these 5 top tips to help when your child hates homework and it takes too long. 1. When it’s taking too long, reach out to the teacher… asap. 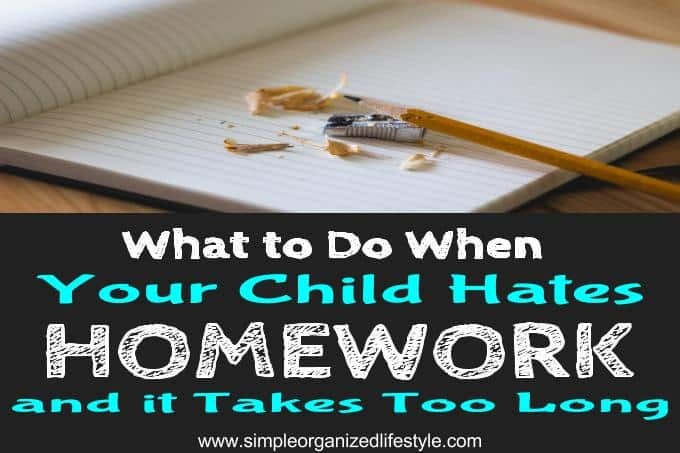 Some kids work at a slower/faster pace so this is just a guide, but if you have a 3rd grade child who is taking 2 hours or longer each evening to do homework, that’s way too long. That’s going to quickly cause burn out for you and your child. Don’t wait. Talk to the teacher. Ask the teacher about how long, on average, the daily homework assignments should take. If you and the teacher agree that the assignments are taking longer than they should, then come up with some solutions together. If you can pinpoint that it’s a certain assignment, ask for an alternative. It’s important to talk to the teacher to see if your child also needs more than the average time in the classroom. It may or may not mean that there’s more to it than a child who hates homework. These conversations could lead to discovering another underlying issue, such as attention deficit disorder, or a specific learning disability such as dysgraphia or dyslexia. If you think this might be a possibility, the website Understood.org is a great starting place for more information and resources. If your child already has a diagnosed medical condition that impairs their ways of learning (sensory disorder, ADHD, migraines, etc) there are state and federal laws that can help when it comes to flexibility with school and homework assignments. The infographic below, from Understood.org, gives an overview of one of the federal laws called the 504 plan. 2. Stay positive and encouraging when it comes to time to do homework. Find the most motivating things you can come up with when it comes time to get homework done. Even if it’s cheesy and your teenager is not buying it, positive words of encouragement are going to put them in a better frame of mind. Even if they both need to get the same results, one is clearly a more motivating way to approach the assignment! Our words can have a drastic impact on our kids’ mindset! I’ve stated above that I’m not a fan of homework, but I don’t make this known in front of my five year old (who, yes, has homework already!) When it comes time to do his assignments I try my best to stay positive… and a lot of #3. 3. Get creative and negotiate to get it done. One of our son’s ongoing weekly assignments is to review the sight words they are learning in class. Instead of using flash cards or pulling them out every night for review, we simply write them on the bathtub that week with a dry erase marker. I’ll make up silly sentences or try to turn it into a game. You could try using a timer and giving an incentive to play a game/iPad/computer after homework is done with older kids. Kids will usually negotiate and ask if they can have more time if they get it done sooner. My response to that would be… as long as it’s complete and neat, go for it! Some kids (ages 6-12) work better when you set an incentive together and monitor it with check marks or stickers until they meet their goals. I have two different incentive templates you can use for this in the free resource library. It’s worth a try! 4. Set up a homework environment that works best for your child’s personality. I’m going to go against the advice you’ve probably always heard here to set up a quiet, distraction-free place for your child to do his or her homework. That is perfectly fine if that’s where and how your child learns best. If your teenager is more productive when attached to ear buds… go with it! Some kids (and adults too) do their best work with noise in the background. Your child may do his or her best work outside on the patio table. Adapt the environment to one that works best for your child’s personality… whatever works! 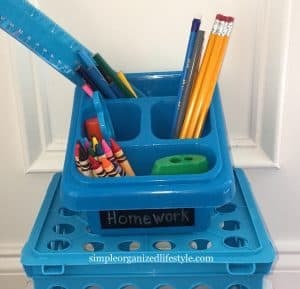 Homework supplies can easily be kept in a small plastic bin for quick access and time saved instead of looking for what is needed. 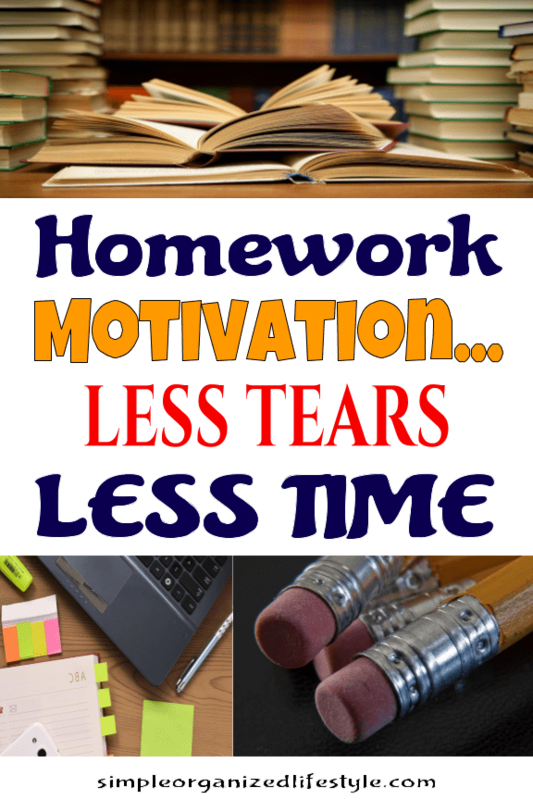 A few routines in place will make it easier to reduce homework frustration and make it more manageable. Please share any tips you’ve found to help when your child hates homework and it takes too long! Thanks for sharing this- there’s so many mamas out there who are having the same issue. Medicine is a really hard, personal decision. You are also right that sometimes siblings share the same parents and that’s where the similarities end- they can be polar opposites! Here’s some things to think about- since he has a diagnosis, the school can develop a 504 plan. That gives them a legal way to modify his assignments, including homework. It might look something like half the math sheet, one math choice, one spelling assignment and 20 min. of reading. Try a timer idea and use Minecraft or extra cartoon time to negotiate. Try a slant board (or propped up lap desk) and put a piece of sandpaper under his writing assignment- if writing is difficult for him, a combination of those two things have been known to work wonders. A great website for solid information about ADHD is Understood.org. YES on the journal, especially if y’all start medication… document his food/sleeping/behavior habits. I think I have a template for that… if so, I’ll email it to you. Hang in there and wish you all the best!!! I imagine it gets tougher as they get older and need to work more independently! My niece (5) gets optional homework although its highly encouraged. She’s set 8 pieces at the start of term and can choose which she does each week. There was a lot of reluctance at first, esp with things she found difficult. We have framed them as mini challenges (she’s quite competitive) and various family members have helped out, each with a different encouraging approach. As I don’t have children, its no problem at all for me to turn it into a 2 hour, off on an enjoyable tangent typr adventure when I get involved with helping out. If you are close to family and friends, rope anyone in who is happy to help! That’s a fantastic idea to frame those accomplishments! Thanks for sharing! Yes, I so agree that family time is important. It was so hard when our oldest was in elementary school. He had so much homework and due to a shared parenting schedule our time with him was already so limited! That is a great point that not all kids do best with a quiet environment! 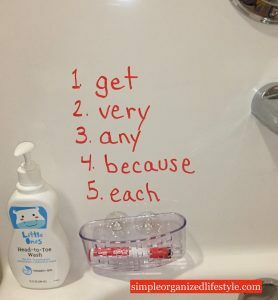 Figuring out what works for each child is the trick:) I love the idea of writing the sight words on the bathtub. Yes, I think family time should be a driving force behind less homework (and because of how much the school structure has changed from years past). I agree, whatever works! Thanks Miranda! I bet your son loves it too… and there’s never any harm with a little m&m or skittle motivation:] Thanks Leslie! Great article. I’m struggling with my middle child who went to middle school this year. I knew there would be a lot of homework and it’s such a challenge for him. He really needs some down time after school but he plays baseball in the evenings so we have to get it done as soon as we can. I feel that too many teachers give too much homework these days. It takes away from time spent with family. Middle school is challenging enough minus the homework! That’s what I hear all the time…it really makes me sad because I agree they need some down time and time with family…like adults do after a day of work! I hope you all get a break after the baseball season!